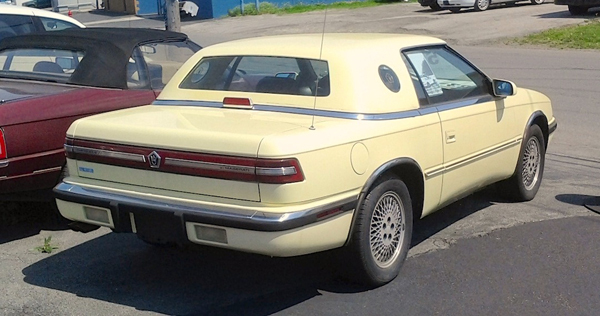 A car with a rather interesting heritage is this 1990 Chrysler TC by Maserati. Confusing name? Yes it is. It looks like many small Chryslers of the era — Chrysler actually designed most of the car, but it was built by Maserati in Milan, Italy. The TC is a two-seat convertible which came with both a soft top and the removable top with porthole windows seen on this example we found recently in Buffalo. A sleek-looking car in certain colors (but not this yellow IMHO), the TC was plagued by a late introduction and the fact that it looked so similar to the much less expensive LeBaron four-seat convertible. To each his/her own. Jim Corbran, RRofWNY Check out our new Facebook page: LuvTheCheapies The post RealRides of WNY appeared first on Buffalo Cars.